Hi! We are a small team of engineers and woodworkers passionate about innovative design and high quality craftsmanship. Everything in our shop is designed and made by us in the USA. Please don't hesitate to contact us with any questions and thank you for stopping by! This laptop stand works great, looks really nice and is of high quality. Thanks!! It's always better when we're together! These beautiful tree bookends come in pairs now. Only $34.95. Sale ends July 10th! Save 25% when you buy a pair of Tree Bookends! Just use coupon code: SAVE25 and the second bookend is 25% OFF. Offer ends June 13th 12PM EST. Today there is a SALE for 25% Off the California Wood Engraving! I return from my trip to CA on April 11th and all orders will be fulfilled shortly after then. Have a wonderful day! Red oak wood is a lightweight oak with beautiful properties and a durable structure. 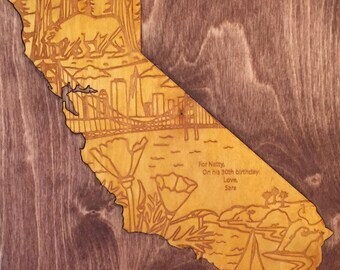 Baltic birch for our best of California, wood engraving. Jon is a Bio-Environmental Engineer and Ivy League graduate who is passionate about sustainability.